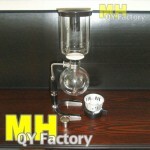 Nostalgic Coffeemaker | SkyLanterns, Hanging Lanterns, CandleBags. This process makes the smoothest coffee possible with no bitter aftertaste. It tastes as good as it smells. Normal coffeemakers pour boiling boiled water over coffee grinds. Perk coffeemakers expose the water to the grinds at 92.2-93.3C in the top pot. This temperature range is within the ideal extracting range. By exposing to the grinds at this temperature for 40 seconds +/-, you will reveal the full spectrum of aromas and flavours giving a denser-textured and fully flavoured cup of coffee. Perk vacuum Coffeemakers were invented around the turn of the century. High end Coffee houses have used this process for over a century and this process is now making a resurgence with the general public. The actual brewing process is very entertaining to watch and the coffee as good as it gets. If you are looking for an item that people will people will talk about this is it. Great promotional item for your business with decent mark-on for the bottom line.